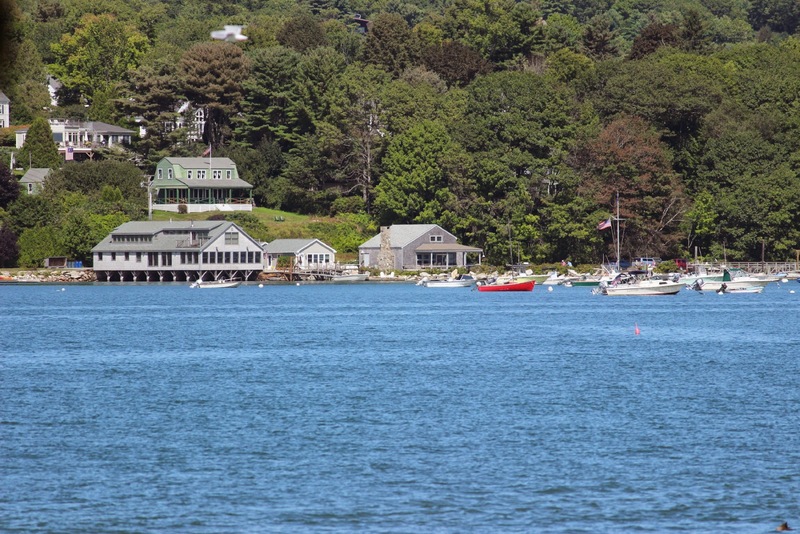 In the center of Naples, Maine there is the causeway with Long Lake on one side and Brandy Pond to the Songo River on the other side. 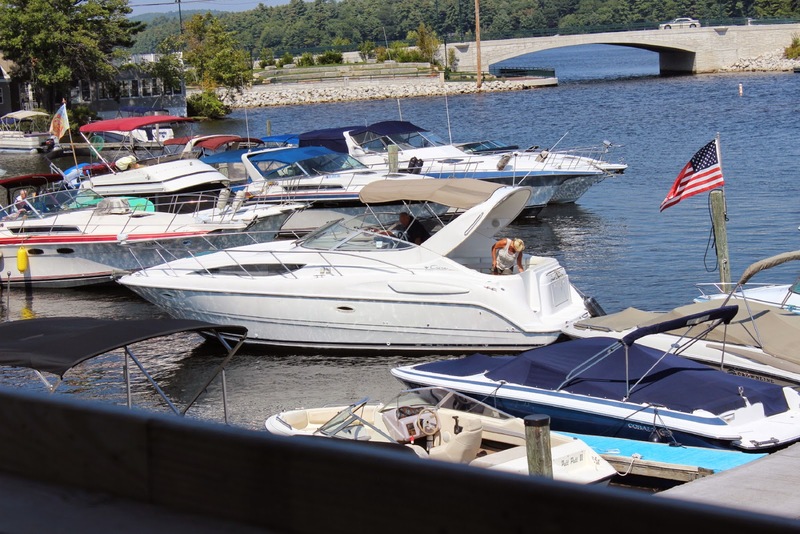 The Songo River will connect boaters to Sebago Lake, the second largest lake in Maine. The center of town has been renovated in the last few years with a new bridge and new sidewalks to spruce up the tourist area. 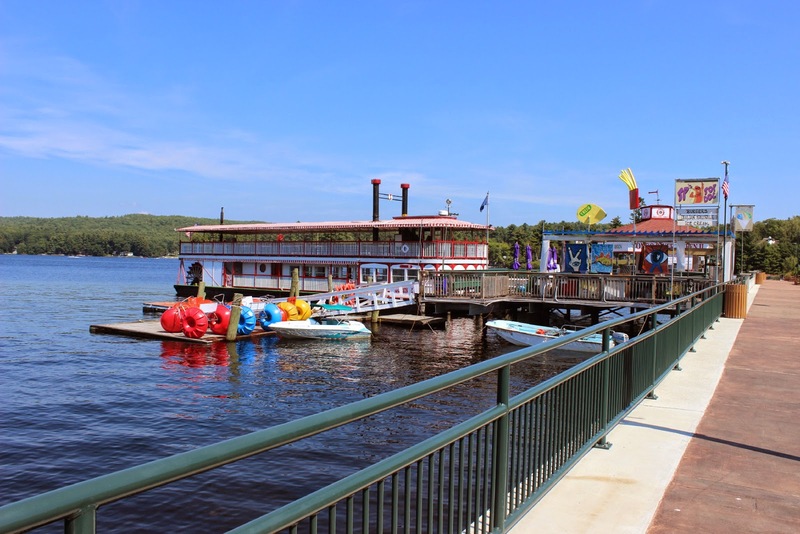 The River Queen still offers rides , although they just cruise on Long Lake and not down to the Songo River Lock. The view from this spot can be spectacular. On a clear day you can see some of the Presidential Mountain Range in New Hampshire. 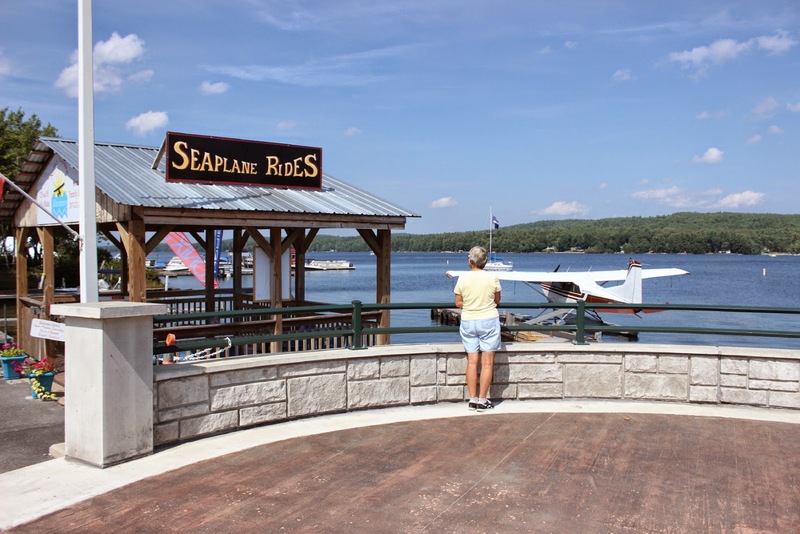 Walking on the nice , new sidewalk to the bridge offers views of private boat traffic traveling between Long Lake and Brandy Pond. Many pontoon boats indicate how locals value a quiet ride on the lake. Captain Jack's is a Florida Keys style open deck restaurant at the Marina. From your table, there is a great view of Brandy Pond, the marina and the new Naples bridge. 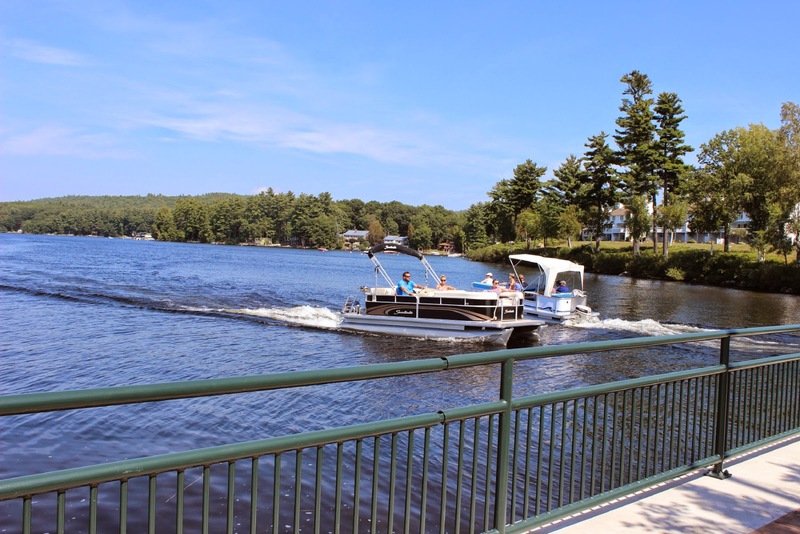 There are some serious private boats here, capable of leisurely travel on the river or fast, all day travel on Sebago Lake. Jan is remembering 1969 and a ride on an airplane just like this one, from this very spot. We shared the ride with friends Peter and Jeannie. Jan said "no way" to a repeat ride. Huh?? 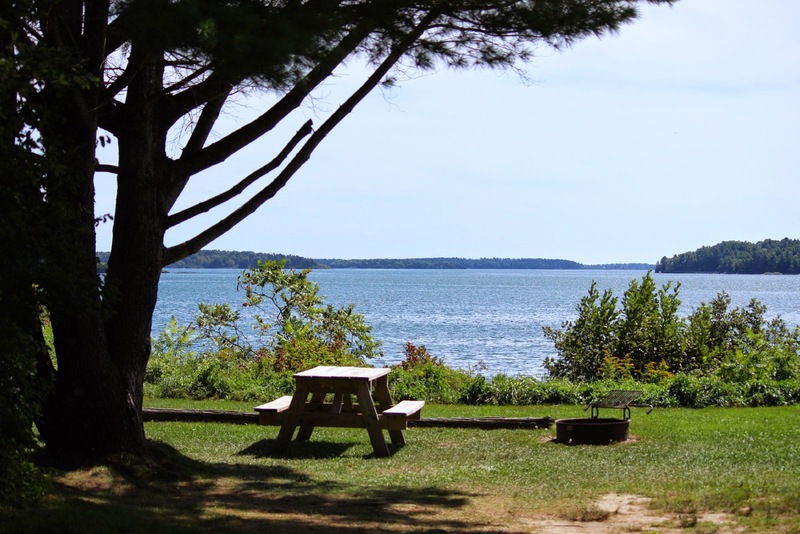 A short distance from downtown Naples is Sebago Lake State Park. Always a favorite stop for us. 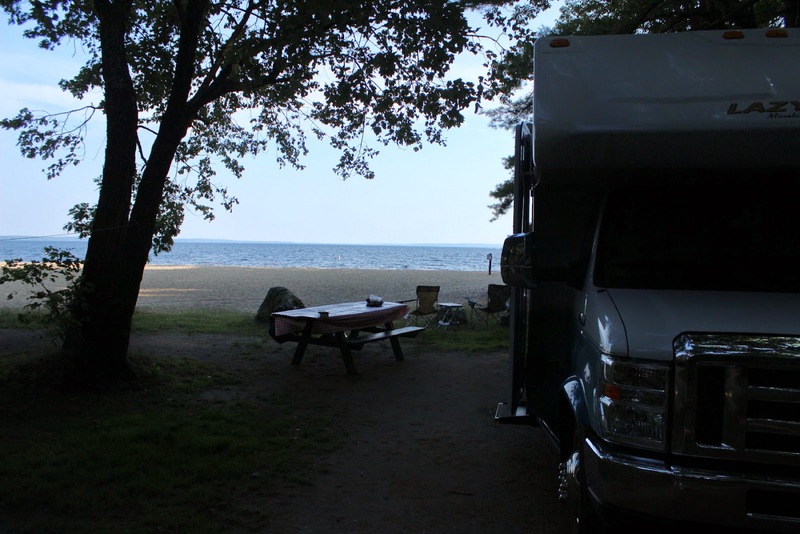 This is the first time recently that we have a choice of the Naples Campground and Site#31, recommended by Sean and Madison. 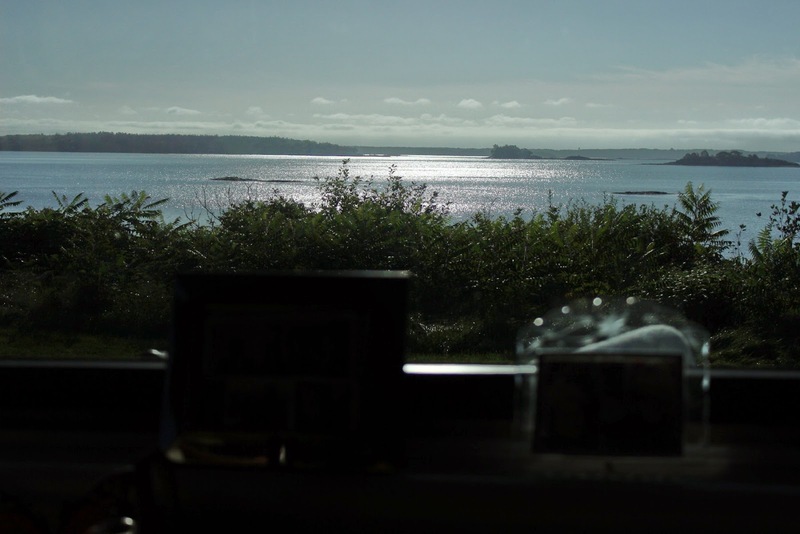 Our rear windows give us a great view of Sebago Lake. And, as you can see, Jan has easy access to the beach. By the way, for campers, these are large sites and many are good for RVs. This campground, Naples, is dry camping. Witches Cove to the right is also quite nice and has a number of electric and water sites. 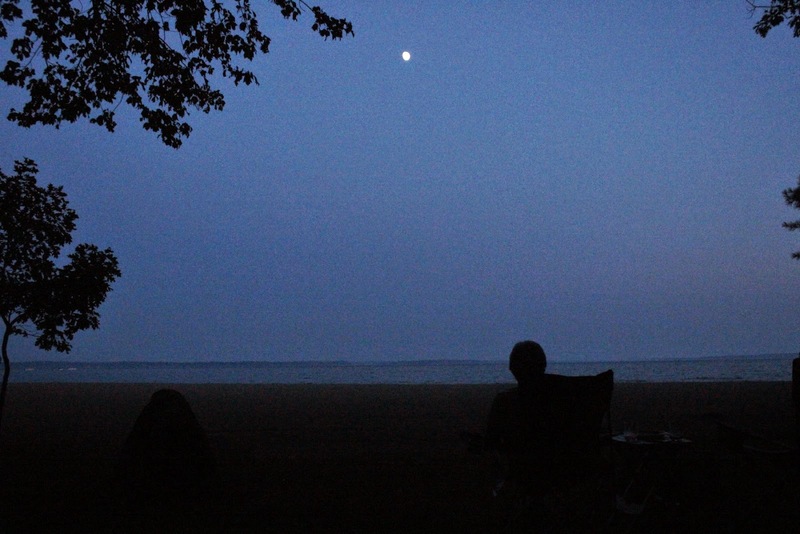 This was a warm weekend in September, so sitting on the beach as the moon came up over the lake was a good option. 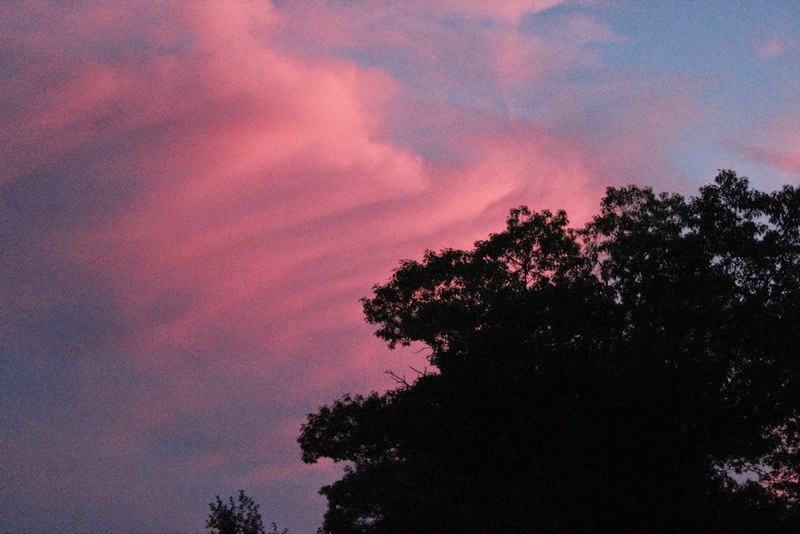 Not a bad location for some colorful sunsets too. Another good stop, just a little north of Portland, Maine is Freeport, Maine. To most people, Freeport, Maine means the LL Bean store and other outlet stores in a picturesque town. 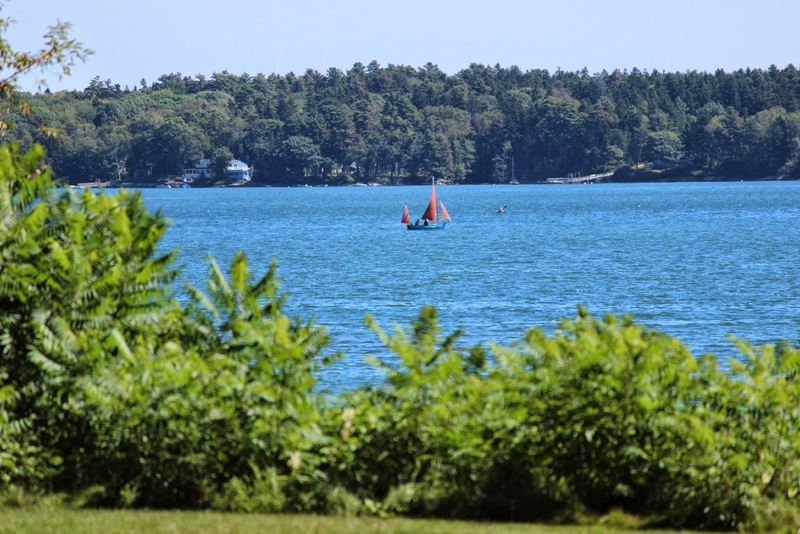 But, Freeport is also on Casco Bay with lots of good ocean views. 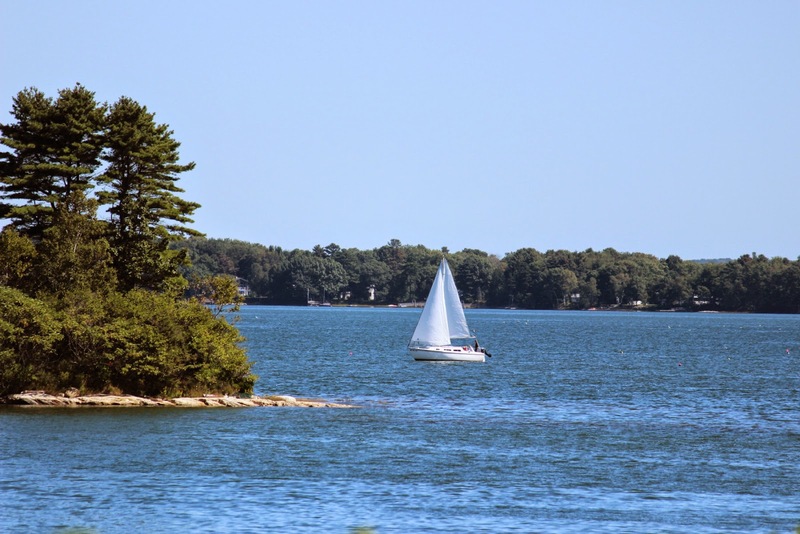 Don't tell too many people, but one of the nicest campgrounds around is Winslow Park , a town park, where the Harraseeket River empties into Casco Bay. With some 90 acres, the Harb family donated this estate to the town back in the 1950's . There are no hookups. 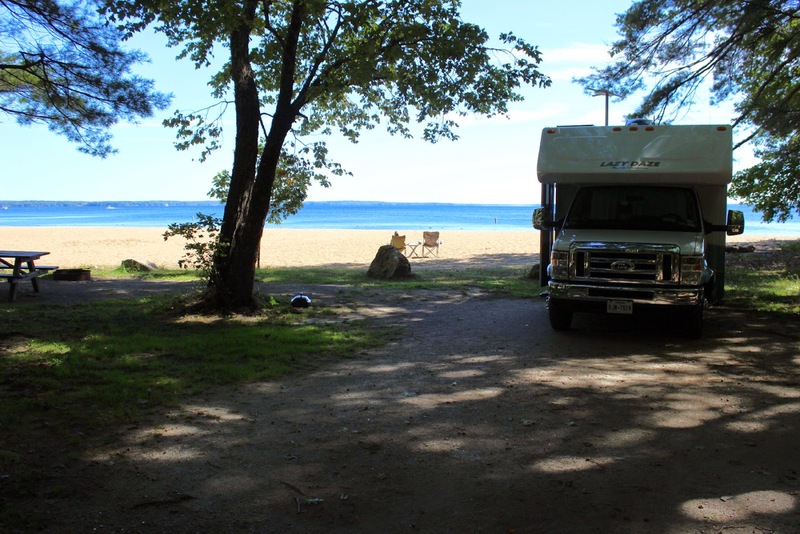 Some seasonal campers are located in large sites back from the water. But all of the water sites are reserved for visitors with a maximum 2 week limit. This is a typical water site and many were available when we visited this year. There are a few trails around the large park. Many great views like this one. It seems there are always sailboats, kayaks, and small fishing boats out inn the bay. One of the views is over to Freeport Marina. The view from inside Lady Blue is so great that we have to add another day! Oh the decisions when your are fulltiming.